July 4th is coming on Wednesday; get all you need for a glorious summer feast at the market this Saturday. As always, we are open 9 AM to 12 Noon at Rhodes-on-the-Pawtuxet, 60 Rhodes Place, Cranston. We have meats and fish for grilling, salad fixings, nuts and cheeses for appetizers, scrumptious breads and baked goods, and, of course, farm-fresh vegetables and herbs. Or leave the cooking to our prepared food vendors: Matilda Empanadas, Ja Patty, and Little Falls Cafe; inquire about their catering options! A weeder’s work is never done; chemical-free farming is a labor-intensive process! 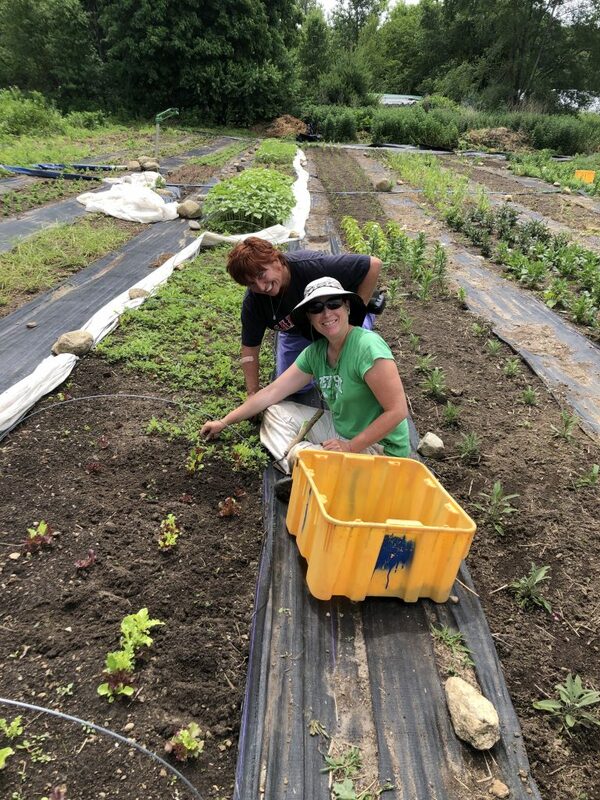 Check out the super job Kim and Cheryl are doing at Blue Skys Farm, giving those lovely veggies the space they need to flourish without poisoning the Earth (or us consumers) with herbicides. Thank you, farmers, for your careful stewardship of the land and for bringing us such healthy food. The Honey Shop returns this week; if you haven’t tried the kombucha, you should! It looks like we are in for an extended heat wave, with temperatures soaring into the 90’s for the next week. Eating well without heating up the house can be challenging, as is conserving energy in such extreme heat. Options include cooking ahead in the evenings for the next day: roast a chicken, boil eggs, cook pasta or grains, steam veggies, toast bread for croutons or bruschetta. Of course, if you have a grill, you can cook lots of stuff outdoors to keep the heat out of the kitchen, and do your prep work at night so you don’t have to work up a sweat: make marinades: cut up meat, fish and vegetables for kebabs, and wash up the day’s dishes. Making light meals with cool foods is a smart and easy way to weather the weather.